Inbound Marketing is a marketing strategy that focuses on getting found by your ideal customers in your target market (your buyer personas) by engaging with them, gaining their trust and ultimately converting them into customers. The fundamental shift to inbound marketing has come about because buyers are able to access a wealth of information over the Internet to try and solve their problem or address their needs before engaging with you as a potential solution provider. 60-70 % of sales are over before a buyer talks to a sales person (source: HubSpot) So, if you haven't done so already, take a long hard look at how you are attracting people to your website, converting them into leads, and then closing them as customers. What are the key stages in the inbound methodology? Attract - Todays buyers are looking online for answers, so companies need to connect with prospects using its website, social media platforms to be a valued resource, providing insights and knowledge, which is why content marketing is so important. Convert visitors into leads by giving them valuable content in exchange for their contact information. Valuable content and some smart ways of interacting with visitors will not only convert but also qualify traffic into sales leads. Close - Through the power of automation, leads can be nurtured and further qualified until such time as they are ready for sales to close. Having deep insight into a buyer's journey allows sales teams to convert more leads. Delight - provide continued value to clients to foster referrals and generate new upsell opportunities. Inbound marketing is not without its challenges, especially for marketing teams with limited resources. But the good news is that Intellegentia can help you implement your inbound marketing strategy quickly, and allow you to focus on your business. 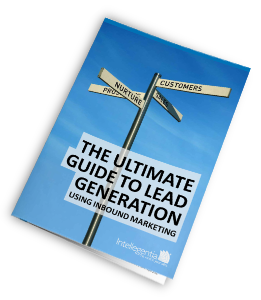 As an Inbound Marketing Agency and HubSpot Partner, Intellegentia can help you define your inbound marketing strategy and run with it using this software - delivering leads and helping you achieve your sales-related business goals. We'll work with you to attract more website traffic, capture leads and nurture those opportunities over time, while using sophisticated testing and analytics to continuously improve your marketing performance. Our goal is to help you close more business. Ready to explore the business case for inbound marketing? We've developed a Financial Impact Assessment spreadsheet which takes account of your current level of marketing activity and your current conversion rates and predicts future growth. The predictions are based on industry averages calculated across thousands of companies who have implemented an inbound marketing strategy. This will help you build a business case and set goals for implementing inbound marketing.